It's the biggest of Molly's. In addition, it is very active. We need to provide a large aquarium to maintain it properly. Once installed, it is very robust and interesting to observe. In addition, it breeds very easily, eats some algae and can have many colors. Indisputable seduction assets! How to feed the Yucatan molly? Omnivorous fish with a vegetarian tendency. It will also browse some seaweed from your aquarium with delight! Molly is very easy to feed. It will easily accept any type of food: frozen, dry, fresh... Everything suits him! For the base, you could offer some pelleted or flake food for vegetarian fish (sold commercially). Fill in from time to time with larvae, worms, artemia... On the other hand, offer him a regular vegetarian part: spinach, cucumber, zucchini, salad... If you offer varied menus to your Molly, it will not suffer from dietary deficiencies. Be careful not to overfeed your fish, and to avoid polluting the water of your aquarium! What kind of behavior does the Yucatan molly have? The Giant Sailfin Molly is a pretty active fish, not shy and always swimming a lot. It is polygamous, that is to say that a male can breed with several females. The male’s parade is very insistent and stressful for the female. This is why you need imperatively to provide 3 females for 1 male, so that its ardor is divided on several females. Indeed, a single female facing a male can die of stress and exhaustion. Who can live with the Yucatan molly? When choosing roommates, pay attention to the water parameters. Indeed, the Molly love a particular water: it is quite hard (it is called «brackish water»). Many species will not be compatible with this! Behavior side, the Molly is rather sociable because it does not care about the other occupants of your aquarium. On the other hand, its dynamic temper, combined with its large size could interfere with some more shy fish. It will cohabit easily with other viviparous fish such as Xiphos or Platys. 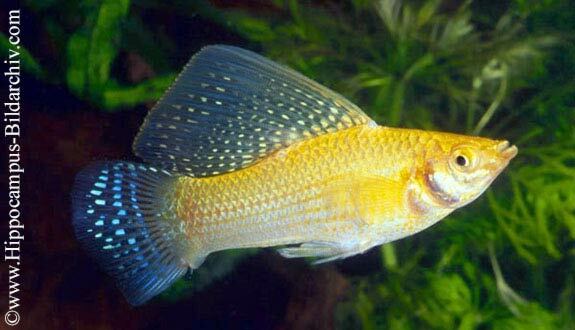 Other species may also be considered, such as some Gouramis or some Barbus. Attention: no possible cohabitation with shrimp that would serve as breakfast to Poecilia Velifera. How to breed the Yucatan molly? Breeding of Molly will not pose any problem since it occurs naturally in the presence of both sexes. After the acclimatization phase, in good quality water (pH 8 and temperature at 27°C or 80°F are ideal parameters for breeding), the first births will be visible in a few months. They will subsequently be very frequent. The male Poecilia Velifera performs an «S» dance around the female by deploying its dorsal fin. It then fertilizes it with its gonopod. It is useless to isolate fry that are autonomous and very resourceful from birth. A well-planted aquarium will be enough to keep a lot of young live. However, if you absolutely want to isolate the fry, do not use a nest. Plan an aquarium specifically dedicated to their breeding. A volume of 30 to 60 liters will suffice to pass the milestone of the first month. This tray will be provided with a heater (temperature identical to the main tray) and a filter. You can either isolate the pregnant female (it has a big belly) in this aquarium and remove it once the release of the fry is done; or fish directly the fry in the main tank after birth. Growth is fast but quite uneven. After one month, their size is sufficient to reach their parents without risk of predation. This will allow them to grow in a large volume (promotes good growth). You can offer them for sale or adoption when they measure between 5 and 6 centimeters or 2 and 2.3 inches. Pay special attention to consanguinity. Indeed, consanguinity can produce fragile fry, deformed and whose life expectancy is very reduced. To avoid this, keep only breeding adults in your aquariums, and sell/feed the fry. Another possible method: introduce new mature fish from time to time, either by buying them or by offering exchanges with other aquarists. Which aquarium for the Yucatan molly? The Poecilia Velifera is a very good swimmer who likes to spend itself. It needs space to swim freely. You therefore need a large aquarium of at least 350 liters (92 US gallons or 77 Imperial gallons) for 3 to 5 individuals. If the aquarium is too small, the fish may become aggressive with the other occupants of the aquarium. In the wild, it lives in a rather warm water, so you need to regulate the temperature of the water to at least 25°C or 77°F (it is a minimum). As for decor, you can put limestones in your aquarium because the Moly loves hard water. Otherwise, you can also dilute 1 or 2 teaspoons of coarse salt (untreated and unfluorized Guerean salt) for 10 liters (2.6 US gallons or 2.2 Imperial gallons) of water. Also install branches or roots. Poecilia Velifera enjoys well-planted aquariums. With that, It will have many hiding places, especially for females. 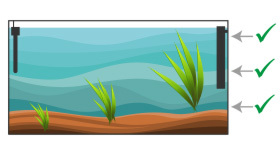 Be careful to leave some free space for swimming: plant on the sides and bottom of your tank instead. The Giant Sailfin Molly is quite polluting. Make a weekly water change of 20 to 30% of the total volume of your aquarium. Make sure that the new water is at the same temperature as that contained in the main tray. The name «Giant Sailfin Molly» comes from the male’s dorsal fin, which, when deployed, looks like a big sail. The Giant Sailfin Molly is usually gray. Other colors exist, due to crosses. The fish are therefore more fragile in this case and this is particularly true for the orange colored fish. Molly can live in freshwater, but they will be more fragile and more susceptible to disease than in brackish water. Very widespread in stores, not to be confused with Poecilia Sphenops (which measure only 10 cm or 4 inches).